Can you allow yourself to think “from scratch”? You are here: Home / Thoughts on Success / Can you allow yourself to think “from scratch”? It would be remiss if we didn’t at least mention a powerful hack that pops up across time and cultures, and many different human activities. The hack is learning to use randomness in order to break set behaviors and thoughts (habits), in order to provoke a change in either awareness, point of view, or even direct change of behavior in itself. For one willing to work with the “provocation”, we have the testimony of history to the innovations, creative results, changes in choices and even new realities created through its use. Its proven profitability is marvelous, but under-emphasized is its power in hacking habits by breaking heavily habituated behaviors but… you have to be clever to use it because… the same mechanism (in different clothing) has been used by millions to create entertaining fantasies and avoid change. I am speaking, of course, of fortunetelling and divination. The difference between good use of random provocation and poor use of it: Good use occurs when one is aware of what one is doing, and is willing to go with the random provocation in order to create a change of one kind or another. Poor use is when someone uses the random provocation as another source for defending the past and shoring up the current view. How do you do it? There are hundreds of “methods”. 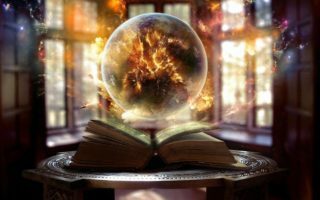 An old form of divination is called “Bibliomancy” – think about your issue, open your favorite “Bible” or Holy Book, place your finger on a page and the closest word/sentence/paragraph is your “divination” (or “random provocation” as we shall call it). I’ve told you previously about a designer who would start a client design with anything he had in hand (paperclips gently tossed in the air and landing on a piece of paper) and then going from there. When someone is genuinely “looking for inspiration” (rather than an excuse or distraction from something else) – a visit to a museum or art gallery might do as random provocation, flipping through a magazine or looking at a site on the internet might do and hence the danger to one who is self-deluding. Any of the more classic forms of divination – I Ching, Tarot, Runes, etc. might function as random provocation (or they might function as stupidity in action – it all depends on person). The late John Cage, avant-garde composer, actually used random provocation within the final form of some of his compositions – most famously in a piece wholly made up of audience noise over a period of time. But he also included the use of I Ching hexagram casting providing instruction for a how a composition’s manuscript should be manipulated in its playing. The creation of methods for providing random provocation are still being created today. What would an episode on random provocation be without the influence of some random provocation? So, I’m going to the American Heritage dictionary and opening at random, sticking my finger on the page, and the word of the moment is “stretchy”. Random provocation conveys a stretchy quality (stretchiness) to our perceptions, thoughts and behaviors by forcing us to stretch the limits within which we have been thinking or perceiving a particular issue, question, obstacle or challenge. It’s like one of those Pilates exercise classes were you are forced to stretch and stretch and stretch and stretch until you are more flexible and fit and better prepared for what comes up. When you learn to use random provocation to create a new direction; you’re not just stretching one perception, but you are developing the capacity to stretch the way you look at problems. Random provocation makes your mind stretchy enough to move around perceptions you made too solid. Not difficult… but you have to go with it to see where it leads. Sometimes you get a new idea (“Pilates for the mind” – a cleverish analogy), sometimes you find something that can transform a situation, and sometimes you can’t get your brain quite enough to make the random provocation useful, in which case, you either try again or change how you are going about looking for input. Try a bit of random provocation for yourself. Choose an issue or challenge you are working on. Write down what you want instead of the problem (not the negation of the problem e.g. “I want the problem to go away”) This is often the “magic change” someone needs to perform but has somehow refused to consider – what actual conditions are desired rather than “the obstacle”. THEN write down what the problem seems to be. (This must be written down). Now consider the randomly chosen word in relation to what you wrote down in step 3 It might present an image, or an analogy or something else – whatever comes up, WRITE IT DOWN. If you wish, you can make a mindmap of what comes up or, if you like the 3×5 cards methods we’ve used to look for patterns; these are fine to extend the “stretching”. As ideas and connections arise, write them down until you can write out whatever the stretching has provided for you. Write TO the problem statement (in relation to it). The idea is to use the provocation to force you out of your rut-think towards something more useful, or a new way to look at the situation – even a stepping stone towards what you want is a good thing. Resist the urge to use the random provocation to reinforce what you already think or know. Can you allow yourself to let the random provocation boot you into not knowing what to think, so that you HAVE TO properly think “from scratch”? It’s like a breath of fresh air for the mind… if you will let it.